What strikes terror into the hearts of would-be thieves? Automatic lights? Nah. High, sharp fences? No way. Ducks? Bang on . Many has the sweat on the neck of a first time burglar turned cold at the sound of webbed footsteps. Waterfowl are responsible for scaring straight more than a few potential felons; now you can tap that power to protect your own home. 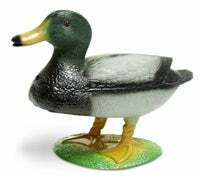 The $10.95 Guard Duck has a built-in motion sensor. If an intruder trips it, the duck begins to quack loudly, and you don't need to be fluent in Duckese to know that it's curtains for you. To those who question whether or not a duck is scary enough to prevent crime, I have but one word: AFLAC .